Some things can't be undone. very entertaining book. I greatly enjoy Preston and Child books. FBI agent Pendergast is a well developed character. Easily 5 stars. Have been an admirer of FBI Special Agent Pendergast since my first encounter with the fine southern gentlemen through a wonderful novel entitled "Still Life with Crows". Pendergast is as interesting as he is refined, his personal life is subject to the age old "good versus evil " complex as well as any case he gets involved in. 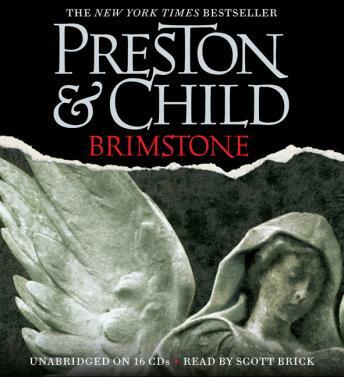 Brimstone was very well written, I especially enjoyed all the traipsing through Italy (Rome, Florence), and the background information about the Stradivarius. The premise of the book was different and entertaining. The ongoing series of Agent Pendergast is a true delight. I would suggest this book and all Preston and Douglas novels (together and separate). Loved this book! Kept me wanting more! Wish they would mention the title of the next book that follows so I wouldn't have to scroll through them all, I love to read them in order! Preston and Child can write tension and anticipation into their stories. I have to give Scott Brick the 5 stars for his narration. He makes the story "sing"
Too long. I couldn't finish it. Many boring parts. Not the best Pendergast book. Usually I like these books but not this one. What a great story! It will keep you on the edge of your seat. Agent Pendergast at his finest. I just love his character. Thrilling plot by Preston & Child! Most entertaining performance by Scott Brick. This was a great book. I am a big fan of Pendergast himself and just about all characters in the series thus far. I have listened to a few thousand hours of audio books and sometimes no matter how compelling a story is, the narrator makes or breaks the listening experience. Scott Brick has done a fantastic job here. He has a different dialect for each character and transitions seamlessly from one to the next. 5 stars all around.